Okay, so I thought about it and I decided I did want to continue this. You seemed to like my first post well enough, and… I enjoyed it. So I probably would have ended up doing it anyway. So I took a step back and looked at 2012. And quite honestly, I’m SHOCKED by what I found. For one, I think we call something a snub if everybody predicted it to get an Oscar Nod and it failed. The one omission that people were going on and on about in 2012 just barely missed the cut here, so maybe we’re more like the Academy than we care to admit. For reference’s sake, here are some of the blogs I visited. And pretty much everybody on this page. I would also like to point out that I made sure there wouldn’t be any ties this time. Anyway, prepare to have your mind blown. This is what the people chose. This matches the academy ballot 7/9. The public seemed to prefer Holy Motors and Moonrise Kingdom to Django Unchained and Life Of Pi. I will admit that Moonrise would have been a worthy nominee, but did it have to come at the expense of my favorite film of the year? I haven’t seen Holy Motors but it sounds kind of interesting. There wasn’t a clear frontrunner that everybody loved this year, but I think most people will be happy with Beasts Of The Southern Wild as the close winner. Just missing the cut were Oscar Nominees Django Unchained and Life Of Pi as well as The Master. Ironically, even though this category was a landslide at the Oscars, here it was the tightest race of them all. Day-Lewis just barely musters up a win over close competitor Joaquin Phoenix. Now, people seem to like a certain pair of foreign actors, namely Trintignant and Levant. Oscar nominees Hugh Jackman and Denzel Washington aren’t far behind, and neither is John Hawkes in The Sessions. Hey, the Oscar Five! I didn’t think that would happen! People did show some love for Marion Cotillard, Rachel Weisz, and Jennifer Lawrence, (in The Hunger Games) but at the end of the day, everyone settled on these five. However, they preferred Riva over Lawrence. I’m not sure how I feel about that. As I said in another post, 2012 was the year Leonardo DiCaprio was robbed of an Oscar. Nobody would have complained if DiCaprio won here. The public didn’t like Waltz’s performance nearly as much, and Alan Arkin didn’t even get a single vote. But the votes were plentiful for Javier Bardem, Samuel L. Jackson, and Ezra Miller. Without a doubt, 2012 was the year of Anne Hathaway. The public agreed with the Academy and awarded her Les Mis role, and they gladly nominated her and Judi Dench over Amy Adams and Jacki Weaver, Adams did get votes though, as did Nicole Kidman and Doona Bae. Ah, the one category that the Academy usually seems to get right. Although you bloggers out there prefer Perks over Pi, you also thought that Lincoln had the best screenplay. Ooh, only 2/5. Although the public seemed to agree with the Academy on one point – the editing in Argo was AMAZING. Again, 2/5. It seems the public is all for giving Roger Deakins an Oscar. Let’s see if he gets any more in this series. Shout out to Anna Karenina, Beasts Of The Southern Wild, Lincoln, and The Turin Horse. 2/5, again! It seems the public was more than willing to give Les Mis the award. Near misses include Oscar Winner Lincoln, as well as Beasts Of The Southern Wild and Django Unchained. 3/5. Bloggers agreed with the Academy and awarded Anna Karenina, while Oscar Nominees Lincoln and Snow White & The Huntsman just missed the top five. 1/3. Let me just go on the record by saying 2012 could be the greatest year for film makeup ever. As well as these three, there was also plenty of love for The Impossible, The Hobbit, Holy Motors, Looper, and The Hunger Games. 3/5. At the end of the day, it’s hard to argue against Life Of Pi, although there was some love for The Hobbit and The Impossible. Only 2/5. This one surprised me a bit, but bloggers fell head over heels for this music. Although to be fair, bloggers did enjoy the Oscar nominated scores of Lincoln and Skyfall, as well as The Dark Knight Rises and Moonrise Kingdom. 2/5. Unlike the academy, bloggers know how to make up their minds. They also liked Life Of Pi and Prometheus. 2/5. The trouble with this is that most bloggers put both sound categories together into one category, which is why they’re probably gone end up matching most of the time. Oh, come on! I remember thinking that surely the bloggers would recognize the brilliance of Rise Of The Guardians, but sadly no. Come on, a movie with this many stories on fanfiction.com should haver it’s fair share of fans, right? This wasn’t even a competition – for the win, that is. And that’s where we end it today. So, what was the Ultimate Snub (TM) of the year 2012? 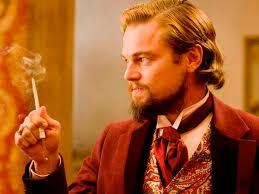 BEST SUPPORTING ACTOR – Leonardo DiCaprio as ‘Calvin Candie’ in Django Unchained. It’s funny, because I already made a post that basically explained how Leo had the perfect opportunity to win his Oscar that year. I mean, Christolph Waltz doesn’t really need two Oscars, does he? Perhaps we may never know why DiCaprio failed to get noticed.